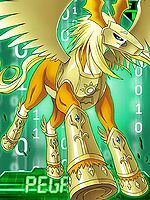 An Armor-level Holy Beast Digimon that evolved through the power of the "Digimental of Hope". 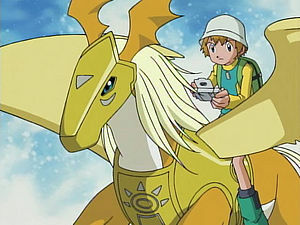 The "Digimental of Hope" has the attribute of "Holy", and those that don this Digimental are able to obtain sacred power. Those that acquire this power are able to exhibit their absolute strength toward evildoers. Its Signature Move is unleashing a powerful blow with its hind legs (Rodeo Gallop). Its Special Moves are firing a holy beam from its brow (Silver Blaze), and creating the void of space inside both of its wings, and sending out shooting stars (Shooting Star). A Mammal Digimon that evolved due to the Digimental of Hope. Special Moves - Fires a holy beam from its brow (Silver Blaze), and creates the void of space inside both of its wings, and sends out shooting stars (Shooting Star). 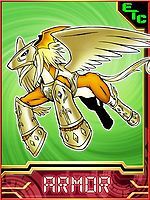 A Holy Beast Digimon that Armor evolves from Patamon with the Digimental of Hope. It is able to run around freely in the sky with the wings on its back. Its Special Move is attacking with a holy beam produced from its brow (Silver Blaze). 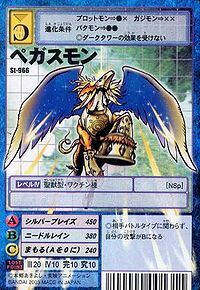 A Holy Beast Digimon that exhibits its absolute strength toward evildoers. Its Special Move is a holy beam (Silver Blaze). 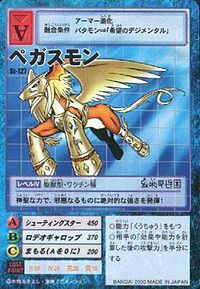 — Digimon Adventure 02: "Digimental Up"
Title: 「天かける希望」 — "Flying Hope"
A mythical flying horse of Greek mythology. 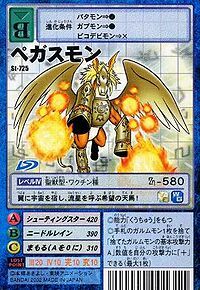 Anime/Manga Digimon Adventure 02: "Digimental Up"
Silver Blaze  シルバーブレイズ Shirubā Bureizu Equis Beam Fires a holy beam from its bow. Shooting Star  シューティングスター Shūtingu Sutā Star Shower/Shooting Star Creates outer space inside of both its wings, sending down shooting stars. Sanctuary Bind  サンクチュアリーバインド Sankuchuarī Baindo Golden Noose Combines powers with Nefertimon to create a ring of light. Rodeo Gallop  ロデオギャロップ Rodeo Gyaroppu Rodeo Kick/Rodeo Gallop Unleashes a powerful blow with its hind legs. 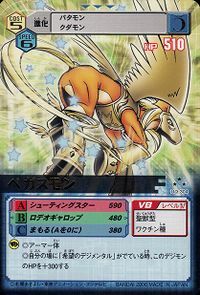 Pegas Drop  ペガスドロップ Pegasu Doroppu Pegasus Drop Attacks with a powerful headbutt. Needle Rain  ニードルレイン Nīdoru Rein Mane Wind/Needle Rain Shoots needle-like hair strands from its mane. 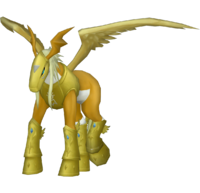 Pegasmon is the partner of Takaishi Takeru, evolving from Patamon using the Digimental of Hope. May evolve from Patamon if level 11 or more with the Digimental of Hope item. 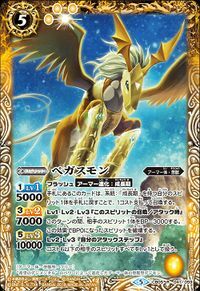 Pegasmon is only obtainable as a collectible card. 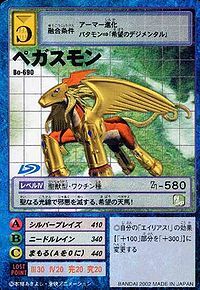 Its card is part of the Digimental of Hope (希望のデジメンタル, Kibou no Dejimentaru) set. Pegasmon is available as a Digimon Medal. Can evolve from Patamon, Piyomon, Agumon X-Antibody or Liollmon. Can evolve to Garudamon X-Antibody, Holy Angemon or Dagomon. With its holy power, it displays absolute strength against evil! It carries the outer space in its wings, a pegasus of hope that calls upon meteors! 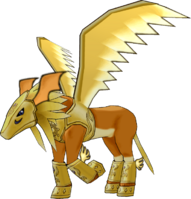 It extinguishes evil with sacred rays, the Pegasus of hope! 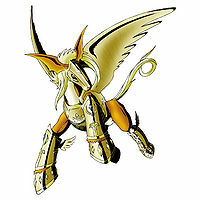 The form Patamon took on after Armor evolving with with the Digimental of Hope. 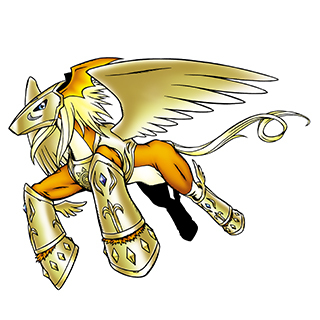 With its body clad in golden armor, it gallops freely in the sky, boasting absolute strength while fighting evil with its holy powers. 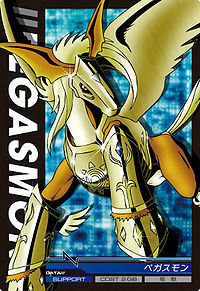 An Armor-level Holy Beast Digimon that evolved through the power of the "Digimental of Hope". This page was last modified on 15 April 2019, at 22:40.